Personal branding is partly about being a rockstar. Someone who stands out from the crowd in a radical way. Chris Brogan had this thing he did a few years back where he referred to his readers/followers as social media rockstars. He even created a huge list of rockstars on his website with links. I liked his idea – it made sense that “rockstardom” was now democratized. It’s really the one thing that most people hate in life… boredom. That’s the real punishment when someone is sent to prison. It’s what causes kids in school to have behavior problems. Boredom causes people to do crazy stuff like split up with their spouses after many years, abuse drugs and alcohol or threaten their own lives and the lives of others with reckless behavior. So how do we deal with boredom? This is the idea that by being outrageous on the outside (appearance, attitude or behavior) will cause excitement and attention. A great example of this is the 1990’s basketball star Dennis Rodman. He was a little extreme with his attention grabbing techniques. 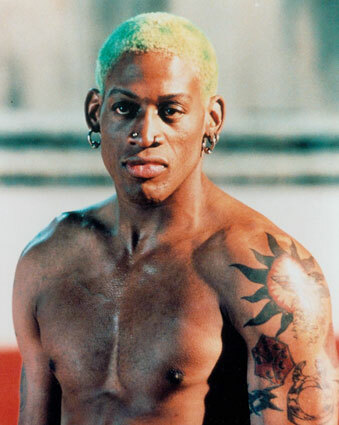 By dying his hair blond and piercing his body he definitely stood out from the crowd. He was a rockstar. It’s up to you whether you’d like to use this style or not. It works – but you also have to make sure you have the substance to back it up. One variation of the peacock theory is to do something that isn’t radical but it is congruent with your personal brand. For example, Mari Smith always wears the same color. Watch her live, on video or meet her in person and she is wearing the same turquoise color. It works. One of the ways I’ve employed this technique is to use the greeting “good morning” during all hours of the day. People often will respond “good morning” back to me without thinking. Then they catch themselves realizing it’s NOT morning and stop to consider why I’d greeted them that way. That’s all I need. I’ve broken down their automated response and I now have a better chance of sticking out in their mind for the future. Another great technique that I’ve observed Eben Pagan do on a number of occasions is “command a room” with his presence. He enters the room with confidence. His personal branding is strong because he’s poised and has himself together. You will also see politicians “command the room” and “work the crowd” by shaking hands and smiling at people. They are very focused on being the center of the crowd and gaining attention. Social proof is talked about a lot in Robert B. Cialdini’s book Influence. Social proof is the idea that most people believe something is valid, good or worthy if they see enough other people believing something is valid, good or worthy. You really need to apply this principle in personal branding. Probably the best example of social proof that I can give you for personal branding is from Gary Vaynerchuk’s Facebook Page. 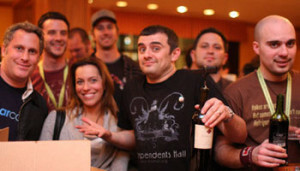 He is standing in the midst of a group of people who all seem to be having a great time together. The group is smiling and seemingly enjoying themselves. When you land on his Facebook page, you can’t help but think “I want to join this party.” And you will most likely click the LIKE button. In the beginning stages of personal branding you may need to manufacture social proof. I’m not talking about lying, but rather asking people for testimonials, references and endorsements. Today’s lesson is this … above all else – be visible. Don’t be boring. Stand out from the crowd while surrounded by a crowd that loves you and your personal brand. To do this takes some effort and hustle. But it will be worth it as you build a personal brand that will earn you more money and create endless opportunities for you. Take the idea of the peacock theory and apply it to your personal brand or business. For example, when I meet someone new I use the phrase “good morning” no matter the time of day. Choose something that can use to stand out and break people’s patterns. Then begin to incorporate this new technique into your regular interactions. The goal is to work toward “rockstardom.” So get started. Thanks Mari for the comment. I'm a huge fan of all that you are doing with social media and Facebook marketing.